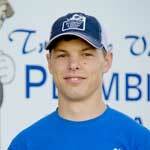 In September 2013, we added another apprentice, Chase Creason, to our great team of plumbers. Chase grew up in Payette, and now he and his wife and daughter live in Ontario on their little horse ranch where his wife practices her barrel racing and Chase dabbles in training. He’s learned a lot in the short time he’s been here with us and is attending Apprentice school in Nampa every week. Chase has a great sense of humor and keeps us all entertained. Thanks Chase, we appreciate you joining our team.